It gives me no pleasure to say I really should be hanging out giant "I told you so" banners. In fact I'm angry, really angry. Angry at those prats who ridiculed me when I said Konect would be cutting more routes, and incandescent with fury with Go East, who have single handedly destroyed bus services in North and East Suffolk, and much of East Norfolk too. There cannot have been a similar example of such inept and uncaring management of a previously flourishing bus company in modern times. But the post mortum can wait - this is what Konect are getting rid of now. The 88 will be scrapped between Norwich and Bungay from SATURDAY March 2nd. However, due to it being sponsored, the section between Bungay and Southwold will continue until March 31st. Passengers from Halesworth travelling to Norwich during March will need to change buses and pay again on First's X41. Konect have said they will be charging reduced fares so through passengers won't be penalised, which shows how much they charge now, and they wonder why patronage has fallen. After 1st April a new operator, I presume First, will take over the route. Also going are the 272 school service, and the 90, running between Halesworth/Southwold and Beccles, another sponsored service. My guess is Borderbus might be very interested in that one. You can read the full announcement here, but I simply must reproduce the reasons Konect give for the pull out, blaming everyone, even the passengers, but themselves. As yet First are to make official comment, although I know they have been looking for some time how they can source the extra resources needed to extend the X41 to fill the gap left by Konect. 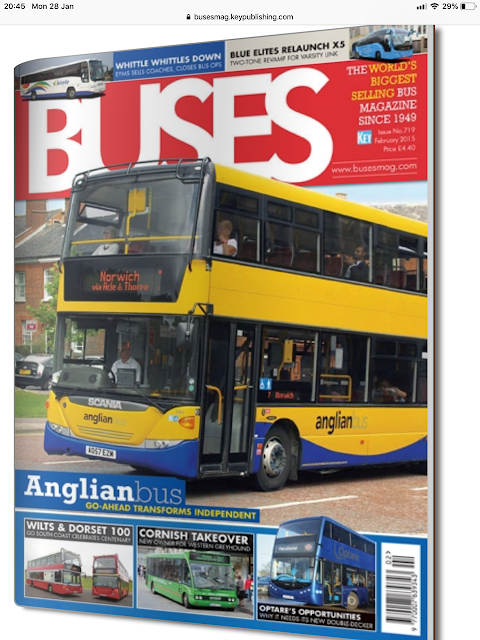 I was reminded of the front cover of Buses Magazine a mere 4 years ago - how things have changed since then. Go Ahead certainly did transform the independent. Into dust. Avada Kedavra, as Voldemort would have said. I'll have more analysis of this announcement and possible repercussions for passengers in due course. Right now pity the customers on the 88, and especially those drivers at Beccles who have stuck it out until the bitter end. They deserved so much better, and I hope they find new jobs quickly. Unless they start running the 83/84 from Rackheath (possibly even then) I can't imagine it'll take them long to abandon those too, with them being former Anglian routes. 83's already gone! Went in September to First. It has indeed, the 38A, how did I forget that?! Was going to have a run out on it following the changeover, before noticing how crowded it was, so it's just on the to-do list now. UK transport is sadly based around short term flings, not long-term commitment. It probably always has been - my father was a lorry driver in the 1950s. But, seriously, aren't Konnect just doing what First did in Clacton; and no howls of anguish there! As long as someone steps in. Yep, the extra buses can probably come from the spares yard that is Essex. All First's Norfolk and Suffolk management have to do is double the income from Norfolk and Suffolk, so they can afford to ditch the rest of orphaned albatross Essex! The Essex passengers can't wait either! I doubt there'll be any howls of anguish at their passing down this way. We'd welcome a carve up between Ensign (yum), Stephensons, Arrow, even Arriva and Go-Ahead (couldn't be worse!) and it'd give the useless County Council a real job for a change! Everyone's waiting . . .
"But, seriously, aren't Konnect just doing what First did in Clacton; and no howls of anguish there! As long as someone steps in." Yes and no - the difference there (at least for me) is that Hedingham were already in Clacton, while FEC aren't in Halesworth (as of yet anyway). Competition on the route isn't to blame of course . I only approved that to give everyone a laugh!!! You say they blame everyone but themselves, yet the quote directly under it says "The reason we are withdrawing these routes is becuase...poor reliability which we have been unable to address at a small operation that is remote from our main business". Many times the Southwald - Bungay part has been cancelled. This is because by the time a bus is sourced to get there, the next service would be operating. I think saying about poor reliability is vlamubg themselves, no? That is blaming the staff and vehicles, not management, with whom the buck should stop. The words pot, kettle and black come to mind - wasn't it they, under the guise of Anglianbus, intesify the 7/47 service and introduce the competing 61 route to cream off the passengers and try to make a fast buck. Will the Bernard Matthews contracts link in with any new services like First's return to Fakenham one wonders . Doubt it as they carry passengers both ways to and from the Halesworth factory. Now isn't that soothing!!! Even if it never happens it's like a massage to the passenger side of me. Aye! Exactly what I was thinking! Comment: Superb. Only operators such as @EnsignBusCo that truly look out for their local community would do this, and improve the industry’s image at the same time. Yet I get stick if I wax lyrical about the likes of Ensign and Reading too much!!! According to our local councillors and MP, with whom I have been in contact, discussions and plans are still being finalised. The cynic or politician in me says that, if the "other operator" had not creamed off some of the traffic on two or three busy routes, Cardiff Bus might be in a better financial state. I presume that the Council can't subsidise the routes for social benefit as they wholly-own the bus company. As a general comment, last time CB made changes to routes, they only got registered with the Commissioners at the very last minute as "short notice" items. One of them was an extension of route X59 into a new housing development which has only run for a day or two because builders' lorries and debris are preventing the buses getting through. First Essex beat that, of course, swinging to a nigh on £3m loss! I'm still not sure how they managed that; it must have taken some doing as the dominant operator with a £53m income in decent bus territory. (Though perhaps, in defence, redundant property leases can skewer any accounts, a bit). Latest reported rumour though has it that First Manchester are being sold on a carve up at a knockdown price, when recent depot closures (which we've had in Essex too) didn't sort out their growing losses. Are our other operators locally licking their lips and readying their armoury? Surely no-one else could do any worse? Just, perhaps, we might not have so long to wait for the next headline. More Cardiff news: https://www.bbc.co.uk/news/uk-wales-47146844. Amazingly there are no electric buses in Wales nor, to my knowledge, any hybrids (though I may well be wrong on that). Beestons 236 btw Sudbury and Clare scrapped from early April,which I guess was inevitable after they withdrew from Haverhill several months ago. The last day will be Friday April 5th. I agree, withdrawal was a foregone conclusion. If loadings are really that bad then logically Felix should extend their midibus operated Sudbury - Long Melford service though to Clare and Haverhill. If usage is too high for midibuses then perhaps Chambers should extend the Colchester - Sudbury short workings on the Bury service through to Clare / Haverhill. Chambers do of course already have dead workings to Clare for their Bury service. Presumably this was the 2315 ex Lakeside. First Essex stop replying to tweets at 1900 so passengers wouldn't have got very far by asking them where their bus was. Buses also need a fair share of financial support. More people travel by bus then any other form of public transport but financial support for them is all but non existent so we are left with a run down very infrequent and very unreliable bus network which charges very high fare for a very poor service. That is simply not going to attract people to bus services , It is not even going to retain their current passengers. Its easy to moan at bus companies about fares.Look at the cost of a new bus even a used one.NBC got buses so cheaply .These days you pay market value unless you buy hundreds a year . In other news: https://www.bbc.co.uk/news/uk-england-dorset-47171223. Gosh, and how lucky they were! I keep banging on about it, but I just don't get First's game with Essex. What are they playing at? Anyone got any idea? We have nothing of Eastern Counties' efforts at improving the appearance and condition of their buses and providing an efficient and competitive network. Timetables are a complete shambles, the network a spiders web of ad hoc routes which often make no sense. When buses are swopped in from Eastern Counties occasionally we are eternally grateful; when swopped out they seem like engineering A&E jobs in desperate need of the loving attention of EC engineers and the bodyshop! Nobody cares. Why not? Every other operator (except a few First culprits in the North, it seems) is at least making some obvious effort. Often, quite obviously, and with at least a bit of apparent success. Drivers are often in despair at what is asked of them and deserting in droves (allegedly some depots seem to be up to 40%+ down on their establishment). They can resign in weeks - once their training bond expires, and do; whilst it takes months to train their replacements; and the cycle starts over, as it has for years. Management seem to have all but given up and effectively disappeared. OK, we get timetable tweaking from some temp (I surmise) with a PC at their desk; but it's another work of fiction as far as staff and passengers are concerned. It looks like even the national Twitter team have taken to reading the riot act to them at the lack of any response! Yet the punters are paying something like £53m pa for this shambles. Not peanuts. They're costing First too, hemorrhaging losses that FirstBus can ill-afford with shareholders on their back out of sheer frustration as they too have been bled dry. A big business, locally. I gather Ensign are thoroughly fed up in the south. Quite understandably. They've already started a bit of growing competition, but no-one else seems to be bothering. I gather Arriva (the obvious candidate, already in Southend, Colchester and Harlow) may themselves be rather a bit fed up with the UK bus industry, and disinclined to expand. I hesitate to mention Go-Ahead East, who don't it seems have a good track record at least locally, but they are already around Colchester and Clacton, and perhaps with a bigger operation could attract a better class of management too, if that is what is required. Stagecoach??? OK they aren't popular locally, but they aren't a disaster either. One commentator has suggested that First have another OpCo "done deal" apart from Manchester, which we know about. So far I've thought First wouldn't be able to sell at a price anyone would be prepared to pay, because of the level of investment required to bring things up to a reasonable standard. First Manchester has perhaps put the kibosh on that theory. If that is going to be a fire sale of a basket case, then why not Essex? Just wondering?? Though the latest figures are to April 2018, there seems to be no sign the operational performance of Essex is improving, nor that anything is being done about it, or that anyone is bothered; maybe it's even getting worse. Surely there are a few more punters for a viable bus network in the conurbations of mid and south Essex than in the rural villages and small towns of West Suffolk? Apparently not though, if First are to be believed! OK, let me be the dog playing in it's own **** (as usual) and throw out a revolutionary idea. If Konnect's Anglian too can't (or won't) provide the right quality of service, why shouldn't they get out and let someone else try? I don't have an answer to that question either. Yes of course, in both cases they shouldn't have made the past mistakes in the first place. Even if they should have been (and even more so, were) obvious at the time. But none of us can turn back the clock, sorry. Don't we all have to learn the often painful lesson to live within our means, sooner or later? I suspect that First's "mistake" is apparent in the first sentence of their Corporate publicity, "About First". It boasts of the number of buses and routes they operate. Is running buses really just about the number of your buses, or should it be more about the passenger experience? Sorry friends, I'm with Ensign (and perhaps even Reading, though I have no experience of them) and think it's about the latter. Just perhaps, though, Eastern Counties might be lucky enough to have someone who agrees? What jumps out at me at those stats is £1.7m subsidy to public bus services, and £9.6m on personal transport. That's no different to what I've seen elsewhere. It's nice to have our own personal chauffeur, of course . . . I know why, of course; and it's a legal right, which a public bus service isn't. It doesn't make it the right balance, though. It's just the way it's panned out ... from our politicians' constant legislative diarrhea. And never look a gift horse in the mouth. Why not? As for the Councils too often they're run by bankers, and like banks. The budget is a necessity, not an end in itself. Maybe it suits HM Treasury. I'm not sure about the rest of us, though. Though if we all don't want or can't afford the taxes, perhaps we could help our less fortunate fellow citizens a bit more, which the politicians seem so incapable of doing. As always, the devil is in the detail. I'm just waiting to see how the local subsidised services fare now under the care of Ensign, compared to their fate under the local Worst lottery. You'll know better than me but I thought most First Sunday services in Suffolk aren't Council subsidised (unlike in lazy Essex where it's the other way around). The Local Government Association (LGA), a membership organisation that includes 349 English councils and works on behalf of councils to ensure local government has a voice with national government, has issued a stark warning that nearly half of all bus services in England are now at risk. First implemented as a statutory duty on 1 April 2008, the National Concessionary Travel Scheme (NCTS) is administered by councils and offers free off-peak travel for residents who have reached retirement age. No time restrictions apply at weekends. Eligible disabled people are also able to obtain the pass. The warning from the LGA comes as a spending review by the Government is currently being decided. Further cuts in funding could result in bus services being withdrawn, particularly in rural areas. The LGA said towns and cities could also see increased traffic congestion, leading to poor air quality for those living on main arterial routes. "Go-Ahead’s regional bus services have a customer satisfaction score of 91%, the highest in the industry, according to an independent study by Transport Focus. While the initial focus will be on ensuring a smooth transition to maintain services from day one of the new operation, Go-Ahead will invest in the people, vehicles and systems to improve the local bus services to customers. . .
As a business that prides itself on looking after our colleagues, we hope to reinvigorate the Queen’s Road depot. We also look forward to engaging in open conversations with TfGM, stakeholders and customers in the Manchester area to better understand how we can create a sustainable and thriving service. . .
Perhaps Anglian (and East Anglia) slipped his mind . . . Or (with the benefit of the doubt) the road to hell is, at least sometimes, paved with good intentions? Didn't they say something similar on the Anglian acquisition (and the rest)? Just a thought though, perhaps Konnect's problems could also have something to do with the successful hatchet job that EC have been doing on them? Though thanks to Norfolk CC it seems they are going to rescue the limited Sunday Bungay/Norwich service so not out of Suffolk all together after all! I'm just a bit old-fashioned enough to believe that a bit of co-operation can sometimes be better than this in-yer-face confrontation all the time! And EC can turn to First Essex for the victim of their next hatchet job! If not from the sell-off of Manchester ops then the money for the replacement Excel fleet needs to come from somewhere! Though I suspect there won't be much money left after making good the pension deficits and paying the wages (and the management bonuses, of course! ), even if they manage to flog it! Trouble is . . . it's a buyers (or buyer, perhaps) market, so how desperate are we?